Leanne Muldrew returns to the women’s national sitting volleyball team for the 2016 Paralympic Games in Rio. Muldrew played for Canada in 2011 and was on the squad that placed third at the Paralympic Games qualifier for the London 2012 Paralympic Games. Canada needed a top-two to advance to those Games. Since then, Muldrew, a former standout standup player in Winnipeg’s club system, has focused on her studies and her career as an American Sign Language interpreter. Canada’s women’s sitting volleyball team will make history in Rio, as it will mark the first time ever that Canada has qualified a sitting volleyball team to compete at the Paralympic Games. 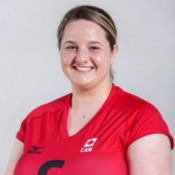 Leanne Muldrew and Canada’s sitting volleyball team played at their first ever Paralympic Games in Rio. After a winless week of competition, the team finished on a high note, winning the classification game 3-0 against Rwanda. Canada finished in seventh place overall. Results – The Women’s Olympic Sitting Volleyball team finished seventh overall. CTV WINNIPEG (Sept 24) Manitoba Olympians and Paralympians who participated in Rio 2016 were honoured and welcomed home Friday night. The Canadian Sport Centre Manitoba held a victory lap celebration dinner. CBC MANITOBA (Sept 5) When the Rio 2016 Paralympic Games start on Sept. 7, there will be three athletes from Manitoba representing Canada. Manitoban Paralympian Leanne Muldrew — Going to Rio!! GOLDENWEST RADIO (Aug 25) Leanne Muldrew loved the sport of volleyball. She was crazy about it from a very young age. She watched it, she played it, she ate, slept and breathed it! THE LANCE (July 22) Leanne Muldrew is hoping to hit her way into the history books.